Cheese. Who doesn't like cheese? Whether it's on a sandwich or a by itself, a nice rich cheese just has a way of making you happy. I prefer my cheese as an accompaniment to fruit, or on a charcuterie platter. I like to be able to taste the cheese in it's pure form, unobstructed by other flavors. Having lived in Germany for majority of my childhood, I developed a taste for cheeses made in the old world style. The cattle are grass fed and the cheeses are aged to absolute perfection. I have always had to pay out the nose to get that quality here in the United States. Then I discovered Kerrygold Cheeses. 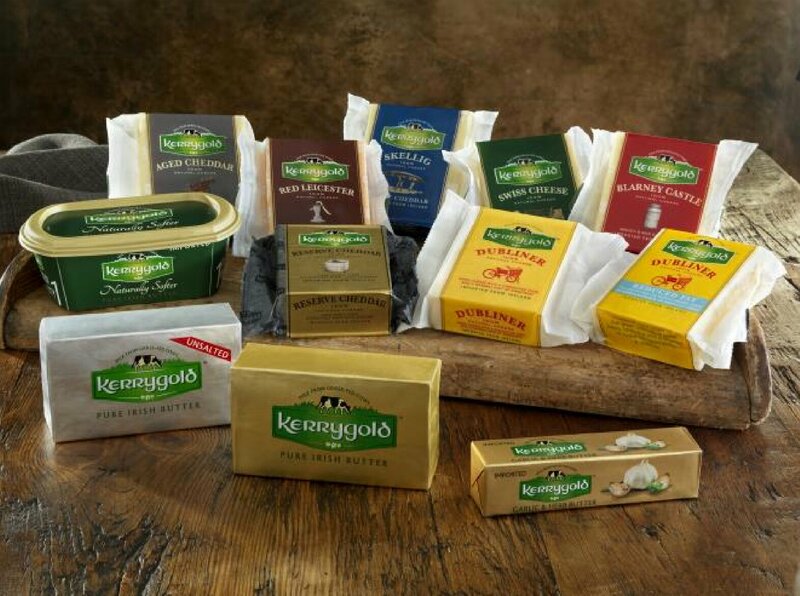 Kerrygold is an Irish cheese maker who stays true to the old style of cheese making. The cattle are grass fed, which imparts a rich, unctuous flavor to their cheese. They also produce butter that is so creamy and delicious you will become addicted to toast. The best thing about Kerrygold is that the price won't leave you stuck with rubbery Swiss on your ham sandwich, you will be able to have a creamy, nutty Swiss from Ireland. Pair your wine with a nice Dubliner, with it's slightly hard texture and sharp, sweet flavors you will find it to be a delightful eating cheese. Blarney Castle has a softer texture and is creamy and mild, and goes wonderfully with fruit. Then there's cheddar... Ugh. I adore a good sharp cheddar, and Kerrygold does not disappoint. The reserve cheddar is rich, full bodied, sharp, and smooth. My mouth is watering just thinking about it. Swiss is my favorite. I would uae it to make chicken cordon bleu. I like Swiss cheese. I'd make some ham and swiss sliders. My favorite is the Cashel Blue Farmhouse Cheese, and I'd make Cauliflower Mash. I would make Cheese Fondue with Kerrygold Swiss Cheese! Love their butter, too! The Kerrygold Skellig Sweet Cheddar Cheese. I would make Crispy Skellig Sweet Cheddar Parmesan Asparagus Spears with a Lemon Aioli Dip. I would like the Dubliner cheese and I would make a grilled cheese sandwich. My favorite is the Reserve Cheddar. I would put it on a sandwich or eat it plain :). I like the skellig cheddar cheese it would be great for mac and cheese. Reserved cheddar. I know it might seem boring but just putting a slice of cheese on a saltine does it for me. I've only ever used the Dubliner from them and it was for a mac and cheese recipe. The Blarney Castle - I would make a nice queso dip. My favorite cheese is the Aged Cheddar, I make homemade mac and cheese. I honestly am not sure which would be a favorite, or what I would make with them... actually my husband would probably snack on them all before I ever had a chance!! My husband and daughter love all cheese. This looks fantastic! i have actually never tried their cheeses... just their butter! i absolutely love it. I would love to try a flavor cheese to make a sophisticated mac & cheese. We just bought some Irish butter for or st patty day feast! It's the best. Oh my heavens I love cheese, this is the best giveaway!! Don't think I have had Kerrygold cheese, but love sharp cheddar to make mac and cheese. We would love the swiss. It would be great on ham and cheese stuffed chicken breasts. I like Kerrygold's Aged Cheddar, it makes the best macaroni and cheese! I LOVED Kerrygold's butter and it's all I purchase now...I had NO IDEA they also make cheese! I'd purchase the swiss to make fondue...bet it tastes the best! My favorite is Aged Cheddar with Irish Whiskey Cheese. I would make fondue with it! Swiss is my favorite. I'd use it to make grilled cheese with apple slices. I like Swiss cheese to make a Swiss and mushroom omelette. I'd love to make a big pot of macaroni and cheese with their aged cheddar. I haven't tried theirs but I love cheddar cheese in mexican casseroles. I'd really like to try their Blarney Castle and Dubliner. My favorite is the Aged Cheddar with Irish Whiskey Cheese. I like to make Crabmeat and Potato Au Gratin. I buy the Kerryold Dubliner Cheese all the time, it is delicious! I usually make grilled cheese with it, but I was looking at their recipes and I'd love to try the :ayered Egg, Bread, Bacon, and Dubliner Cheese Casserole. Yummy! My favorite is the aged cheddar. I like to eat it with apples or pears. I would use the reserve cheddar in homemade mac and cheese! The Aged Cheddar with Irish whiskey and I would make mac and cheese. I love the Kerrygold Swiss cheese. It is perfect in my St. Patrick's Day Rubens. I'll be making their recipe for Heirloom Tomato Galette using their Skellig cheese. This is a recipe we like for Sunday Brunch! I love Swiss cheese, but I would probably eat it without anything else! Maybe put it in a sandwich. I would use the Swiss in a ham and cheese sandwich. Why mess with good cheese. Ummm, you definitely have my mouth watering! Haha. I've never heard of Kerrygold but their stuff sounds delicious. I'd use their Reserve Cheddar to make macaroni and cheese to go along with my italian chicken. Mmm. Reserve Cheddar and make my moms recipe for mac and cheese its my kids favorite food to eat! I have honestly never tried Kerrygold cheese, but I love their unsalted butter! I guess I would use some Swiss cheese to make French dip sandwiches. i love swiss and would make a swiss cheese quiche. Aged cheddar for cheesy mashed potatoes which is great with ham. I love Swiss cheese so I would make Pastrami and Swiss cheese sandwiches on toasted rye bread. They all look amazing, but I'd first love to try the aged Swiss Cheese, so I can make a gourmet Ruben sandwich! It looks like it would melt like velvet! Aged Cheddar. I would make their recipe, Bubble And Squeak. My favorite is Reserve Cheddar. I would make Cheesy Inside and Out - Double-Faced Grilled Cheese Sandwiches. I love all of Kerrygold's cheeses. I would probably make a potato dish with the cheddar. Or maybe I'll just slice it and eat it plain! I love cheese!! I have not had this brand before and it sounds delicious. I would use the Aged Cheddar and make mac & cheese. I have only tried Kerrygold Swiss but I love to make fondue with it. It is smooth and so delicious. The swiss Cheese. I would make a lasagna with it. The reserve cheddar I would use t make some homemade macaroni and cheese along with the butter! I think I would go the dip route and make a cheese fondue. After taking a quick peak at their web site I think I would enjoy recreating the butter braised nectarine and aged cheddar salad, this dish looks delicious and perfect for spring! I would love the aged cheddar for my Mac and cheese! Yum! I make a mean salad with grilled chicken, strawberries, red onion, sunflower seeds and would use the Cashel Blue Farmhouse Cheese. I would like to try the aged cheddar on a grilled cheese sandwich. Mmmm Aged Cheddar - honestly I would probably just eat it hunk by hunk - no cooking involved! I love their aged cheddar and it makes an amazing homemade mac n cheese. The Kerrygold aged cheddar in my beer cheese soup!! It is soooo good! My favorite is the aged cheddar. I buy kerrigold butter all the team, it's the best. I would use the cheese to add to casseroles. I love Dubliner and I would like to make Welsh rarebit. I would actually use them all, but I would get the most use out of the Kerrygold butters for baking and recipes. I'd love to try their Cashel Blue Farmhouse Cheese! I love their aged cheddar, but haven't seen the blue before in our store. I'd love to try a spinach and strawberry salad with balsamic vineger dressing with this crumbled on top! Yum!!! I would use the Reserve Cheddar and make homemade Mac N Cheese. The aged cheddar is my favorite KerryGold cheese! I love to make Mac and Cheese for the family I use Kerrygold unsalted butter and Aged Cheddar. You know its a hit when teens and toddlers eat it. I would like to try the pure Irish butter in some of my baked goodies... maybe a pound cake! The Aged Chedder would be great in some macaroni and cheese. I like the aged cheddar, especially in au grautin potatoes. Skellig doesnt last long in my house... just a little corner nibble here, another little nibble there. I like the Aged Cheddar for mac and cheese for Easter dinner! I like any kind of cheese like colby, mozzerella, swiss, cheddar and I ciukd make casseroles. I've actually never had their cheese, but I use their butter all the time! I think I would use a blend of the cheeses to make a good, homemade mac and cheese. The siss looks great. I could make amazing ham sandwiches with it! I would have to say the Aged Cheddar would be my first pick and probably my favorite. I wouldn't make anything with it...just yummy cheese and crackers...I might even add ham. Yumm! The aged cheddar, and I'd use it in my baked mac and cheese. I like the AGED CHEDDAR, I would make mac & cheese with it. I simply love cheese. I have never tried this cheese before but I am sure I would love it. I enjoy it by itself, in dips, in casseroles, and every way you can think of. Thanks for this opportunity. The only Kerrygold cheese I have had is their Dubliner but it was soooo good! Been meaning to try more. I LOVE cheese! I love the taste of Cheddar Cheese and love to make Grilled Cheese sandwiches from thinly sliced pieces . I am a big Dubliner fan. I would love the aged cheddar and make homemade mac n cheese casserole. Haha, the first time we tasted Dubliner, we were in England at our friend's house. Isn't that funny? We would make grilled cheese sandwiches OR salad with cheese chunks. Both super yummy! Love love love KerryGold Swiss and would KILL to be able to still find it. My local Publix stopped carrying it and no one else has had it in years. I'd make... well with swiss , the most amazing sandwiches, whatever I'm in the mood for. WIth the other products, still depends on my mood as I cook and bake often. I've only tasted their butter, which was delicious! I'd love to eat their swiss cheese. My favorite cheese is Swiss. I am not much of a cook, but I can make a Hamburger with Swiss cheese. I had Kerrygold for the first time Christmas..my word the very best. mmmm We love their butter! I love swiss cheese! I would use it on our fried eggs! I would love to try the Blarney Castle Cheese to make the skillet white lasagna recipe listed on the website. Looks so yummy! The Dubliner is my favorite. I might make a roasted red pepper & cheese panini. Aged cheddar would be good to make homemade mac n cheese with ham. I LOVE all cheese!! I would make some homemade macaroni & cheese first!! Yummy! I like the Swiss! I would make a Ruben since I have never made one before. My favorite is Mozzerella for Chicken Parm but I also would like the reserve cheddar in my Scalloped Potatoes. I would use the aged cheddar to mac mac n cheese. I love swiss cheese, I would definitely make some turkey wraps with swiss. I haven't tried Kerrygold Cheeses before so I don't have a favorite but one of the recipes on the website looks really good it's the Beef Rolls in Tomato Ragu and feature's the Dubliner cheese and would love to make it. I would love the reserve cheddar to make a grilled cheese sandwich! I would use the aged cheddar to make chicken divan. I would use the Garlic and Herb Butter and Aged Cheddar to make grilled cheeses for the family to go with homemade tomato soup. I love their Dubliner cheese and would love to try the recipe for FIG AND WALNUT FOCACCIA WITH DUBLINER CHEESE. I would like to try the spreadable Dubliner cheese with ritz crackers. Sounds great. This is the best giveaway!! Don't think I have had Kerrygold cheese, but I would love sharp cheddar to make mac and cheese. I love the Kerry Gold Swiss and aged cheddar. They both make the best grilled cheese sandwiches you ever had. Aged cheddar for a grill cheese sandwich or omelet. i would love the garlic herb butter on eggs and toast with salmon! Ages Cheddar with Irish wiskey I would make broccoli Cheddar soup . I would love the Kerrygold Aged Cheddar, for mac & cheese. I'd like to try their Swiss Cheese andI would make Rueben sandwiches with it. I just like the name Blarney Castle cheese because it reminds me of when I went to the Blarney Castle this past October. The castle itself is neat, but the grounds are what make it worth the visit. I think I would make my husband some sort of cheesey potato dish with it. I would love to win some Kerry Gold products. My favorite Swiss cheese in the world. I would make some grilled ham and Swiss sammies! I would love to win some Kerry Gold products. My all time favorite cheese! I would have to make some cheesy, buttery, scalloped potatoes! Kerry Gold has the best cheese and butter products ever! I would use the Swiss and make a YUMALICIOUS Quiche Lorraine! I love the aged chedder the best. I love it on a grilled turkey and cheese sandwich. I am dying to try their aged cheddar! I would make some incredible grilled cheese sandwiches! the Reserve cheddar and I'd use it to put on burgers! I have never tried this cheese but I would love to try the aged cheddar. I make a mac and cheese casserole and this would be great. Their Kerrygold Reserve Cheddar makes a wonderful spinach cheddar quiche. I'm a big fan of good old cheddar cheese. So I think I'd go for the Reserve Cheddar first. And I might make some homemade mac and cheese with it! Yum! I love aged cheddar and I love to love to make homemade mac and cheese. I love a good smooth Swiss Cheese. Liked to make grilled ham and swiss on rye. I would use the aged cheddar to make cheese enchiladas. Aged Cheddar...I'd make a chicken, broccoli and cheese casserole! Aged Cheddar and honestly I would just eat it sliced with cracker, veggies and/or apple slices. I would use the aged cheddar and swiss and make mac and cheese. I would love to just eat any of them with crackers and apples! I'm a cheese head hah! I've never tried Kerrygold cheese, but I think I'd love aged cheddar. I would love to make mac and cheese or a loaded potato with it. A good Swiss I'd put in my baked egg dish, on sandwiches and with chicken cordon blue. I would love to try their aged cheddar in a nice macaroni and cheese dish. The aged Cheddar is my favorite cheese from KerrryGold and I would make baked macaroni and cheese. They all sound amazing! I think I would use the aged cheddar on some hot ham sandwiches. We don't have Kerrygold here so I can't say I have a favorite. I love cheddar, though and I'd grate it and use it tons of recipes. I would like to try the aged cheddar! I would love to try the garlic butter for mashed potatoes! I would like to try the swiss cheese and I would make a sandwhich. I want the Blarney Castle.. I would make cheese quesadillas! Oh my --- this is made for me! I absolutely love cheese. I think cheese should be eaten with almost everything. My favorite is probably baby swiss. My favorite type of cheese is mozarella cheese, I love it shredded over lasagna or a salad. I haven't tried any of their cheeses! I would like to try them though in mac n cheese! i've never had any of their cheeses before but I love swiss cheese. I'm not sure what I'd make with it but I'd think of something. I love swiss cheese and I would make stuffed chicken breasts with it. I would love to make a dip with the aged cheddar! The Aged Cheddar is great in homemade baked Mac & Cheese. I would use The Aged Cheddar with Irish whiskey and make homemade cheesy Au gratin Potatoes with it. I love the skellig cheddar cheese. I make my own hamburger helper with it! We get the KerryGold butter and the Dubliner cheese at Costco we love it so much! I really like using both to make a baked mac'n'cheese. I would like t try the Unsalted Butter because I would like to whip up the Skillet White Lasagna for Two and I think that it would be a healthier option. I love to snack on cheese and crackers, with apples and grapes. I like almost every type of cheese. Anything from a spreadable cheese like Brie, or a sharp cheddar. I would make hamburgers and add the aged cheddar to them.